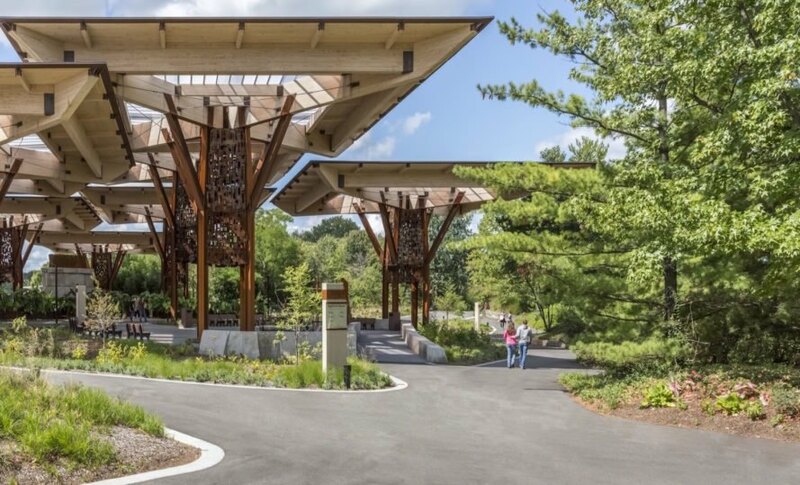 Artful rainwater harvesting design has taken root at the Indianapolis Zoo. RATIO Architects recently completed the Bicentennial Pavilion, an open-air events space modeled after a lush rainforest with 11 steel-framed “tree canopies.” Built primarily from natural materials, the pavilion is a beautiful example of multifunctional and sustainable design that provides 40,000 square feet of weather-protected events space while collecting and filtering 100% of its stormwater runoff. The Indianapolis Zoo Bicentennial Pavilion and Promenade was made possible by a $10 million grant provided by the Lilly Endowment in 2015. The money came with the requirement that the zoo “implement a game-changing initiative that benefits the community institution’s long-term sustainability.” To satisfy the zoo’s needs to expand visitor infrastructure and the Lilly Endowment’s condition, RATIO Architects designed an open-air multifunctional facility that could be used year-round and replace the zoo’s former 400-person events tent tucked into the back-of-house areas. 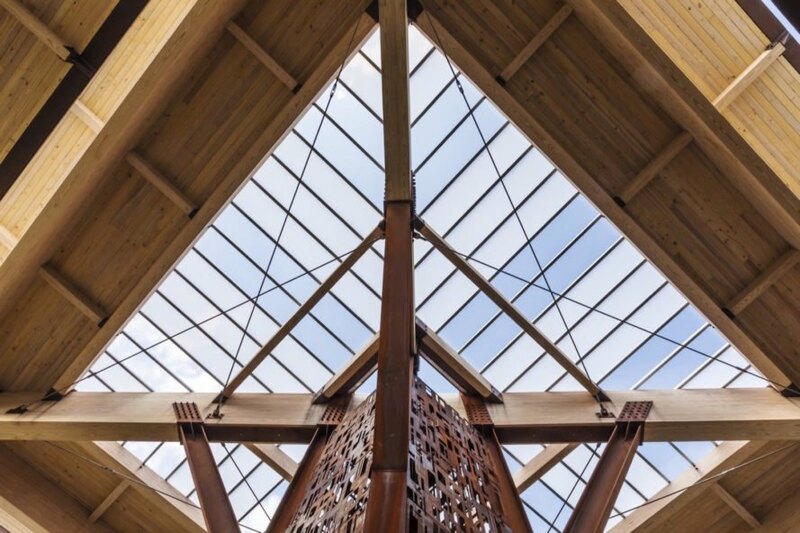 The sustainability angle came from the use of natural materials—each tree-like column is built of 63 individual timber beams, while a hearth of rough-back quarry block limestone rests beneath the canopy—and stormwater management. 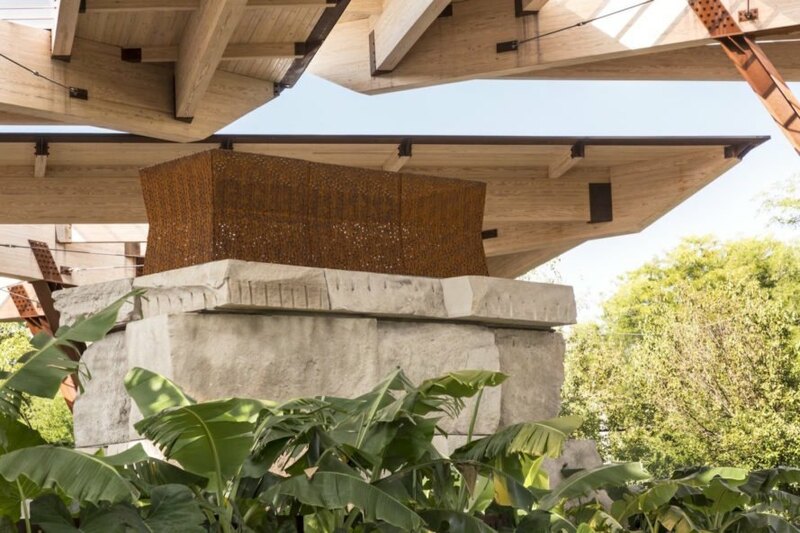 The pavilion canopy funnels rainwater down the tree-like column’s laser-cut weathered steel rain screens and into planting beds, where it then percolates through a water quality unit and is held in a 14-foot deep water detention bed designed to accommodate 100-year flood events. 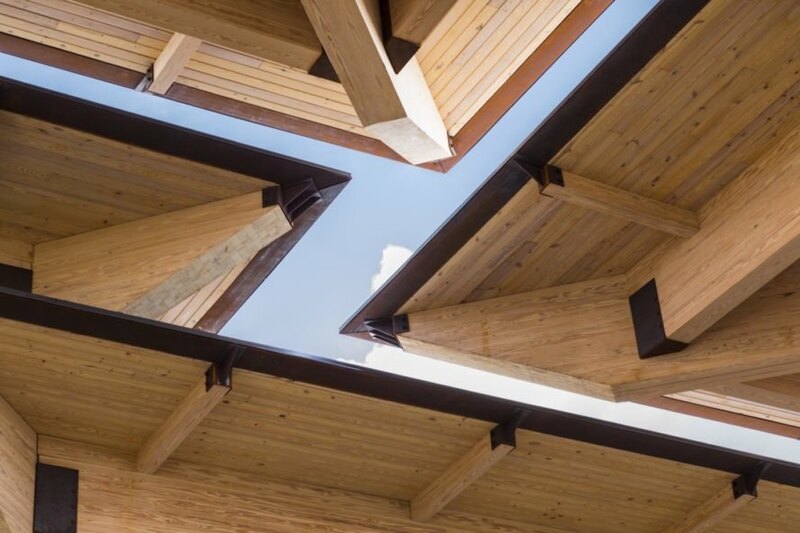 The angled pavilion canopy is built of translucent roofing materials to let filtered light shine through, just as in a real rainforest canopy. The Bicentennial Pavilion is split up into two main event areas, each of which accommodate up to 400 guests. The pavilion can also be converted into one large event space for up to 800 guests. The pavilion’s north side is designed for the new bird exhibition, Magnificent Macaws, with a custom-designed stage and perch to showcase the birds on their twice-daily flight through the Pavilion. 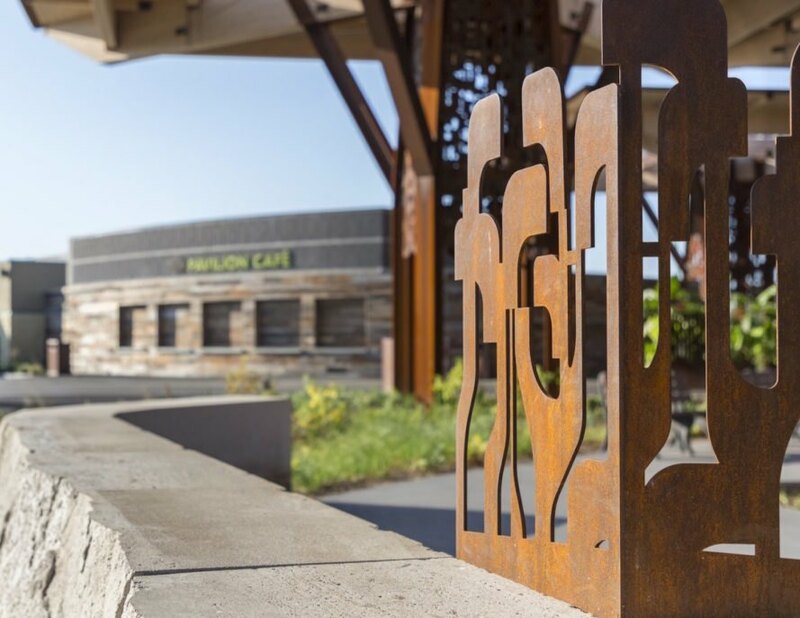 Artful rainwater design has taken root at the Indianapolis Zoo. RATIO Architects recently completed the Bicentennial Pavilion, an open-air events space modeled after a lush rainforest with 11 steel-framed “tree canopies.” Built primarily from natural materials, the pavilion is a beautiful example of multifunctional and sustainable design that provides 40,000 square feet of weather-protected events space while collecting and filtering 100% of its stormwater runoff. 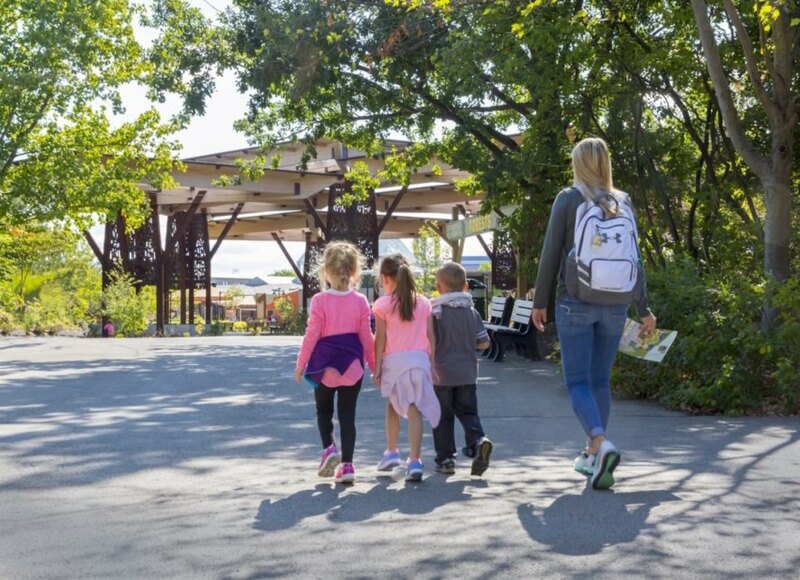 The Indianapolis Zoo Bicentennial Pavilion and Promenade was made possible by a $10 million grant provided by the Lilly Endowment in 2015. RATIO Architects designed an open-air multifunctional facility that could be used year-round and replace the zoo’s former 400-person events tent tucked into the back-of-house areas. 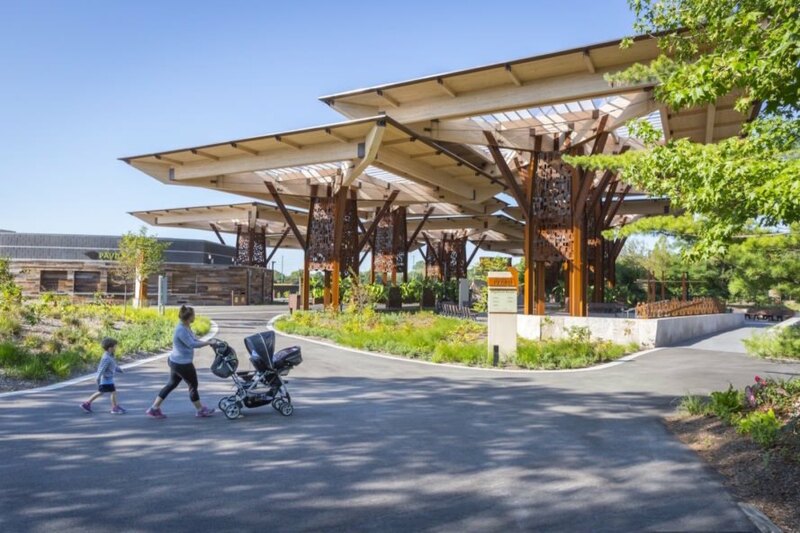 The sustainability angle came from the use of natural materials—each tree-like column is built of 63 individual timber beams, while a hearth of rough-back quarry block limestone rests beneath the canopy—and stormwater management. The pavilion’s north side is designed for the new bird exhibition, Magnificent Macaws, with a custom-designed stage and perch to showcase the birds on their twice-daily flight through the Pavilion. The pavilion canopy funnels rainwater down the tree-like column’s laser-cut weathered steel rain screens and into planting beds, where it then percolates through a water quality unit and is held in a 14-foot deep water detention bed designed to accommodate 100-year flood events. The Bicentennial Pavilion is split up into two main event areas, each of which accommodate up to 400 guests.